We have on offer optimum quality nylon fittings that are designed and developed using advanced technology and quality raw material. The heavy nylon products we manufacture are made as per BIS, ISI and various other standards so that they cater to the needs of most of the automobile industries. These products are made from high quality raw material and tested with the help of various measurement instruments such as vernier caliper, micro meter, digital gauge that verify the standards of the product we offer to our customers. 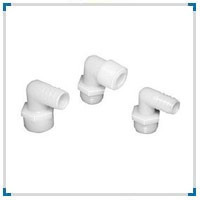 We are offering wide range of Nylon Fittings.